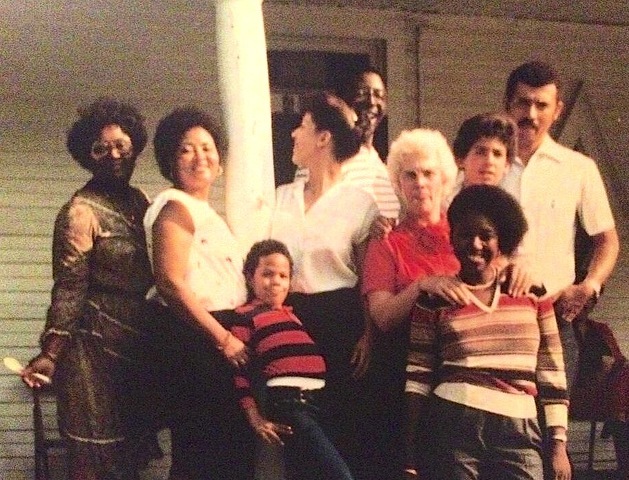 A family photo featuring a 12-year-old James Franklin (second from right), circa 1984. James Franklin was sent a digital copy of a family photograph the other day, from his older sister Debbie. Nearly three decades old, the photo is a bit grainy. Otherwise, time has been kind to the family heirloom of a picture that Debbie emailed to her younger brother from her home in Langhorne, the same suburban Philadelphia town where the two of them grew up with their mother Josie. The photo was of a family reunion. There were smiles all around and a tad bit of good-natured goofiness in the shot taken on the front porch of the white clapboard Battle family homestead in Rocky Mount, North Carolina. There’s Aunt Donna, Aunt LaWanda, cousin Greg, uncles William and Doc. And there’s Josie Franklin in a bright red blouse, her daughter Debbie looking away from the camera on her right, with her son James peeking over her shoulder to the left. “My sister kind of sent that to me out of nowhere the other day,” Franklin said. Not nowhere. Rocky Mount. The town is located an hour east of Raleigh and about 140 miles to the west of Nags Head on the Carolina coast, with a population of about 56,000 these days -- only 10,000 more than 30 years ago. It’s not where James Franklin grew up, but it did help make him the man he is today and teach him the yesterdays of his family from over 150 years ago. Franklin was on Penn State’s fourth annual Coaches Caravan trail earlier this week. At a midweek stop, he found himself surrounded by a small group of five, a friendly mix of Penn State PR folks and beat writers. He was talking passionately about his past, bringing laughter, a bit of awe and newfound understanding of a second-year Penn State coach who usually guards his private side. What followed was Franklin’s life with a single mom, spent in Philadelphia (Josie) and Pittsburgh (Jim); the influence of his many aunts, all divorced and well-educated despite their cotton-pickin’ childhood; and a family tree that has strong roots in Rocky Mount and then the Steel City. And so it went, in a seven-minute and 46-second monologue where Franklin let his hair down – metaphorically speaking -- and provided a peek into James’ early years, as well as his family’s. That’s the same family property in the 1984 photo that pictured 12-year-old James Franklin peering out from behind his hip sister Debbie. The 43-year-old Franklin was clearly proud of the photo. It brought good memories. And it provided a visual for his story, so he spent awhile digging through the archives of his cellphone to find it. At last he found Debbie’s email, and scooted over two chairs to share the picture. Quickly, everyone huddled around. Franklin pointed out everyone in his family and joked about his big head of hair. Oh, yeah. Then he’d continue. Understanding the dynamics, the history and composition of Franklin’s family might explain why he is so passionate about relationships that are real and lasting. He didn’t have many of those growing up, a situation exacerbated by divorced parents, one an African American and the other British, living at opposite ends of the state. “My dad was in the Air Force and stationed in Manchester,” Franklin explained. “He met my mom, eloped to Ireland, then he brought her back to Pittsburgh. They started popping out beige babies -- me and my sister. My dad got a job working for General Motors in Trenton, so they moved between Trenton and Philly, did that until the plant closed. “My mom’s from England, so that makes my family in a lot of ways small because basically the side I grew up with was just my dad’s side of the family. Everyone in England I just saw a handful of times. My mom had two brothers. One died from polio, not long after birth. It was one of those deals (his arms out), ‘Take him home and love him.’ My other uncle … my mom was walking down the street and he stepped off the curb and was hit by a bus. So I have no uncles and I have no cousins. The Geoffrey after James is very important to Franklin. He spells it out – “G-E-O-F-F-R-E-Y” – and quickly mentions he was named after one of his deceased uncles. An uncle he never met. Franklin spent summers in Pittsburgh after his folks broke up (Jim died in 1997, Josie in 2007), and considers that an important part of who he is. Part of that is due to his aunts -- most of whom married into the Franklin family, then later divorced. But they remained close. “That’s how I was brought up – raised by mom, but all my holidays and all family time was spent around my dad’s side of the family,” Franklin said. “Although my mom raised me, and my mom and dad weren’t together, all the relationships on my dad’s side of the family are divorced. So although my mom is not from that part of the family the women stuck together, so we would still spend all our Thanksgivings together. It would be my mom and it would be all of my dad’s cousins and all the children. And they would just sit around bashing all the men. “I remember sitting at the table, when they’d do that and they’d go, ‘That’s OK baby, we know you’re going to be different,’” Franklin smiled and extended his hands, vigorously shaking no. Laughs all around when Franklin shared that one. It was funny, but brought to life what it was like as a boy in a world of women that featured aunts, his mother and Debbie. Women of whom he is intensely proud. So there was Franklin in a hotel meeting room in Linthicum, Maryland, a few miles from the BWI Airport. He was asked about Jim, and shared about James. He was near suburban Washington, D.C. where his aunts made their mark. The next day in the Caravan he was headed to Pittsburgh, and in two weeks Philadelphia. The Rocky Mount photo emailed from Debbie was on his mind. Franklin was finishing up as he started to frame his years with Josie and Jim and Aunt LaWanda and in Rocky Mount and Pittsburgh and Philadelphia. A while later, Franklin reflected on his reflections. He was joking, but in a head-shaking way. 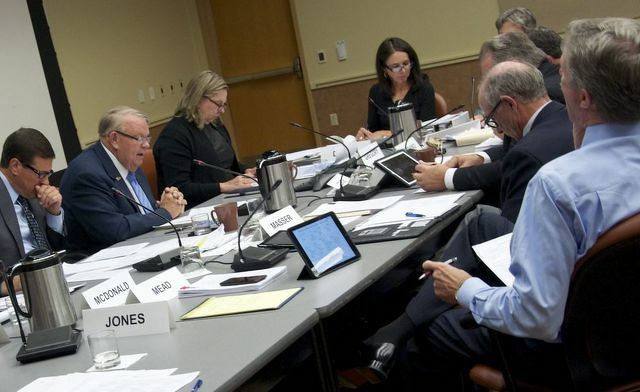 The Governance and Long-Range Planning Committee of the Penn State Board of Trustees has, on occasion, been the scene of fierce debates. At the committee’s Thursday meeting, there was some disagreement about the ideal role of emeriti trustees, but things remained fairly calm.